Here's one of the new online slots game available. Enter this mystical land of fairies and enchanted surroundings. Daintily designed to capture magical innocence, this online slots game is simple yet mesmerizing. Goldwyn’s Fairies ushers you into their magical kingdom while rewarding you with money. It’s like walking into a sweet dream while receiving tangible rewards. The slot games online have 5 reels and 20 pay lines. And welcomes both beginners and seasoned slots players with a betting range of 0.10 to £250. It is also mobile compatible so you are never too far away from this beautiful land. Just For The Wine Game Development is a relatively new software company (established in 2016) and they are still working on building their name. Their focus so far has been on video slots, catering to online casinos globally. Goldwyn’s Fairies is amongst their first few games, and we are thoroughly excited to see what they come up with next! You begin the game going through a bewitching forest. You’re led through it with magical music, and a game board that is framed with delicate little gold carvings. The graphics are not too elaborate, nor do they utilise 3D aspects to make the game more vivid. When you play this online casino slots game, however, you realise that it’s not necessary anyways. The ambience and the theme of the game are captured decently without the use of new edge technology. This feature only gets triggered when you land this symbol simultaneously on reels 1, 3, and 5. When that happens, you receive 10 Free Spins – 9 of which utilise the Returning Wild feature, and the last is a Free Spin. During the first 9 rounds, Goldwyn may grace you with a presence and the spaces that she enchants turn to Classic Wilds. 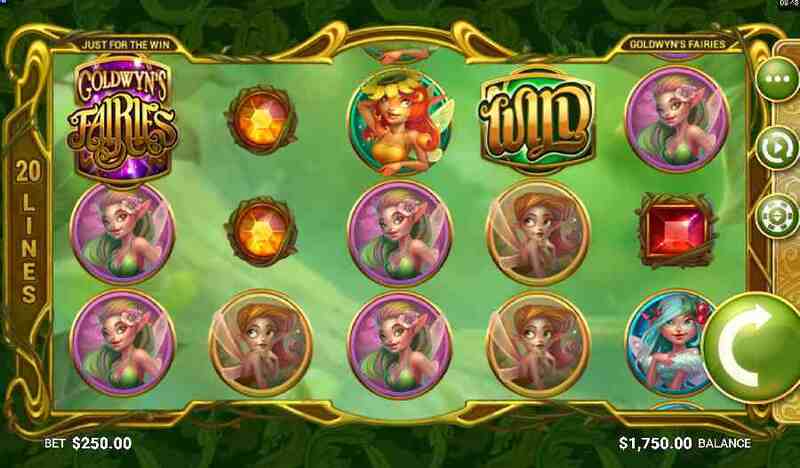 All the 15 available symbols on the reels can be converted to Wilds giving you a great payout! This symbol appears on the third reel. It converts any Classic Wild to a Returning Wild. So the idea is you get to keep spinning until you have exhausted all the Re-Spin Wild symbols on the reels.